We aim to drastically reduce new HIV infections: increase equitable access to quality health services through innovative, integrated, comprehensive and high impact services and programs that can be delivered at scale. Our work is anchored in a Research-Policy-Practice -RPP framework (Hatua model) through which we implement evidence informed programs. We pilot innovative solutions to the HIV challenges identified in the national and community priorities and support scale up for population level impact. Our programmatic focus 2018-2021 is on HIV Testing, HIV Prevention, Care and Treatment and Sexual and gender Based Violence as articulated in our Strategic plan .We use research and implementation evidence to strengthen health systems and support policy development. As of 2017, we are working in 25 of the 47 counties in Kenya. 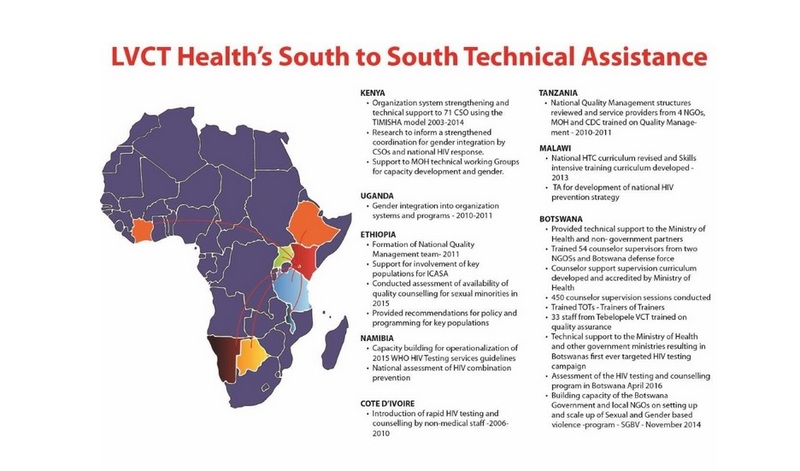 We are a technical support resource for countries in Eastern and Southern Africa. Accountability: We are efficient, transparent and responsibly apply resources entrusted to us for optimal benefit to our beneficiaries. Quality: We do our personal and professional best to deliver to the satisfaction of all. We set and maintain the Gold Standard. Integrity: We consistently live to our commitments and hold ourselves to the highest level of moral and ethical uprightness and honesty. Courage: We are trailblazers. We boldly take leadership on new frontiers, question status quo and undertake change where need be.